The Alhambra motif has been a signature design of Van Cleef & Arpels since 1968, symbolizing luck, health, fortune, and love. 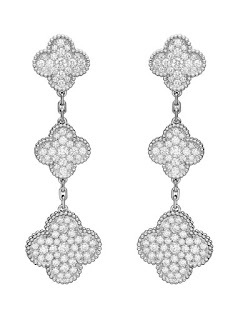 The Duchess of Cornwall's earrings are from the Magic Alhambra collection, the maison's modern interpretation of this iconic quatrefoil motif. The handmade pieces feature three graduated Alhambra motifs in 18k white gold and pavé-set diamonds (around 158 diamonds with a total weight of approximately 4.25 to 4.5 carats) with chain link connections. Their current retail value is listed at $48,000. 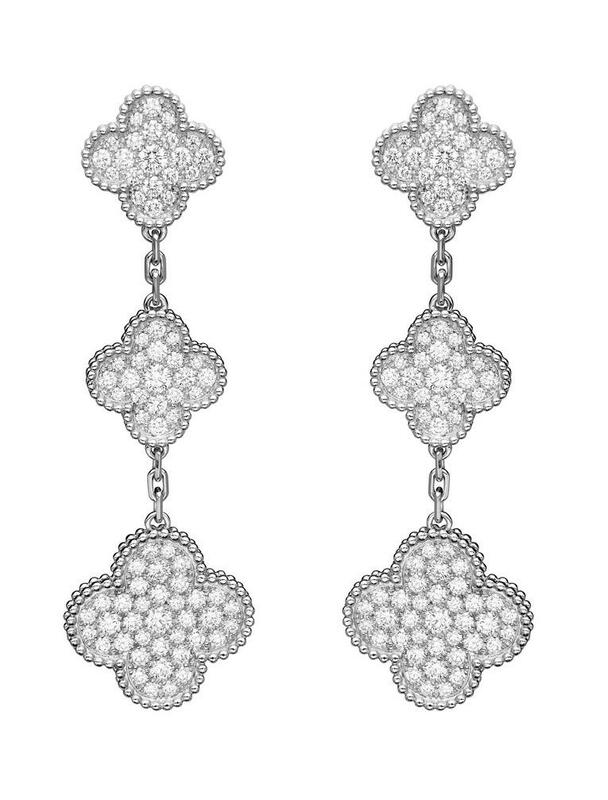 The Magic Alhambra collection itself dates from 2006; these earrings have been seen on The Duchess since 2012, and they join many other modern pieces from Van Cleef & Arpels in her collection. They're one of the longer pairs of earrings she wears (which is great, in her case, because they are long enough to actually be seen under her signature hairstyle), and have been worn to several evening events.